Perry Russom reports from Leicester, where the new legal pot shop is negatively affecting a nearby local business. At Breezy Gardens in Leicester, it's a big time of the year. In one month, the farm close for the winter. 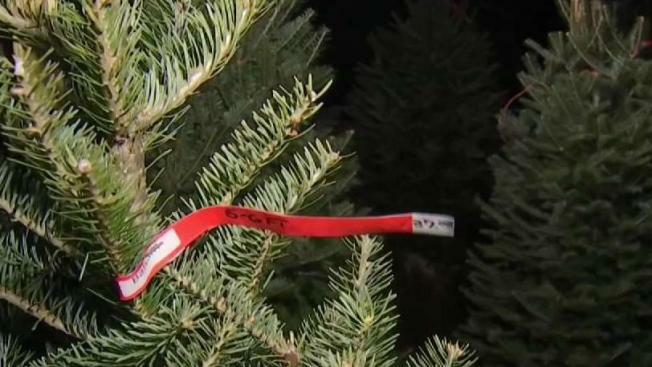 Money made from Christmas tree and wreath sales will have to last them until Spring. They have one problem - their new next door neighbor. "I'm hoping that the people who are going to Cultivate get in the habit of stopping at my place," said Kim Miczek who owns the farm with her husband John. Cultivate, the recreational pot shop around the corner, opened a week ago. In that time, the recreational marijuana industry and surpassed $2.2 million in gross sales, according to the Cannabis Control Commission. The Miczek's are not as lucky. "We're probably 20-percent down on our Christmas tree sales," said John Miczek. Kim said she tries not to think about it. She said long lines at Cultivate clogged up streets, deterring potential customers from coming to their farm. "People couldn't get here because of traffic jams," said Kim. They had to add signs to their parking to let drivers know the spots were for their customers, not Cultivate's. They even had to hire private security to guard their lot. The couple was at the town's emergency town hall meeting Monday night. A day later, they said it's getting better since they changed the traffic pattern. The next challenge is this weekend. "This is the big weekend," said John. "This is the make it or break it weekend." According to the Miczek's their losses were early enough that they may be able to make it back. The sales next weekend will let them know for certain.